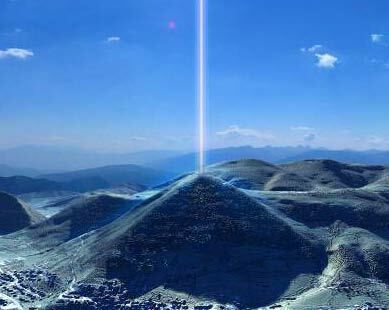 A team of physicists detected an energy beam coming through the top of the Bosnian Pyramid of the Sun. The radius of the beam varies with time, from 5 to 20 meters with a frequency of 28 kHz. The beam is most of the time continuous and varies in strength during the year. Its intensity is not constant but modulates, and sometimes it is even absent. The beam can move around in a radius of 15-20 After analysis of the sounds, it was found that the beam has a primary constant carrier and a second carrier over the primary.